Select the Classic Grilles bronze register covers to replace your floor, ceiling or wall vents which are rusted and outdated. These decorative wall vents are handmade and come with pre drilled screw holes and screws for installation. If you will be using bronze register covers for floor installation, please make a note during check out. The Arts and Crafts decorative wall vents are made from solid bronze and have a 1/4" thick faceplate making them durable enough to support weight. Our bronze register covers are sand cast here in America to provide you with a quality product. The decorative wall vents are equipped with a diffusing damper which will help regulate your rooms airflow. Hand rubbed bronze register covers are available in an antique, light or dark patina of your choice and will likely blend in with any decor. Order your Arts and Crafts decorative wall vents and have the entire order ship for just one low cost to your home or job site. 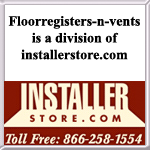 Tip: When ordering the bronze register covers, get the measurement of your actual hole opening and not from an existing vent. The 8 x 4 decorative wall vent will fit into a hole measuring that size. The outer faceplate will have an additional 2 inches added to help with wall mounting. Note that each bronze registers covers are made by hand so sizes may vary slightly. Important: Once you have ordered the decorative wall vent, it can take 7 to 9 weeks for them to be made and shipped. Because the bronze register covers are handmade, they are considered a non returnable, special order which cannot be canceled once the order has been placed. 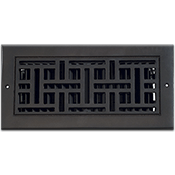 Select between other decorative wall vents which are also made by Classic Grilles here in America. Purchase bronze register covers air returns that come with a screen back for your cold air needs. This Arts and Crafts decorative wall vent will make a mark in your home with its classic style. Make this practical purchase today.